September | 2013 | Sobriety is a journey, not a destination. 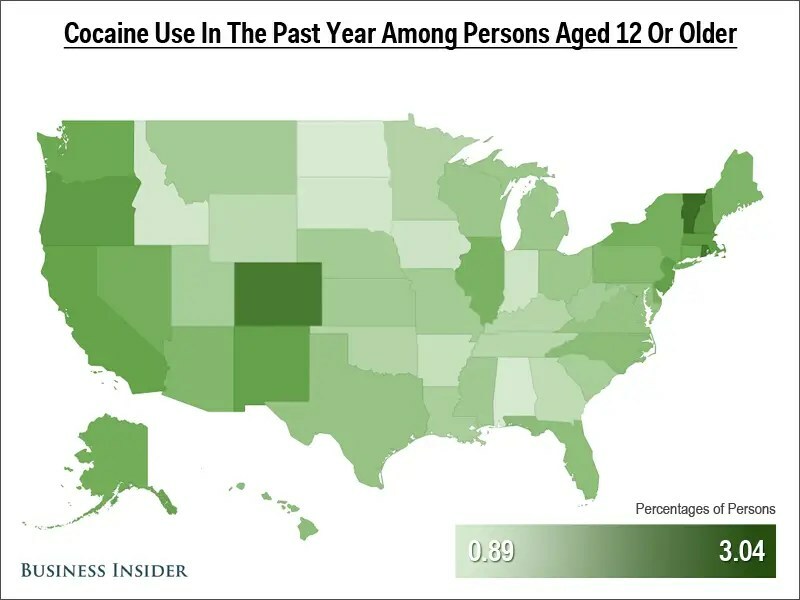 Illicit drugs are most popular on the West Coast, Colorado, and the Northeast according to 2010-2011 surveys from the Substance Abuse and Mental Health Services Administration. Other regions of the country have their own vices, too, as the South has the most smokers and the Midwest has the most binge drinkers. We’ve mapped the data to identify these and other trends in U.S. drug use. 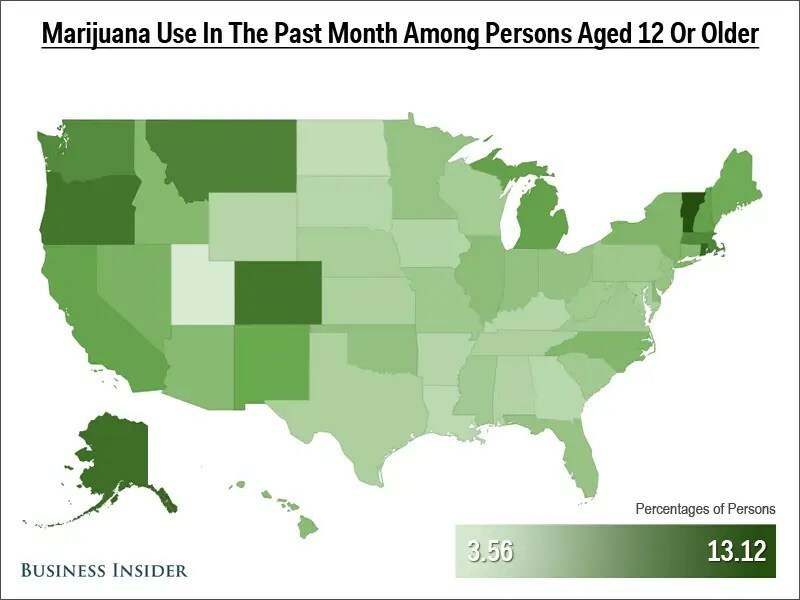 Below is a map of illicit drug use by state, with the highest rates found in the West, Northeast, and Colorado. Vermont is the druggiest state, with 15.29% saying they have used illicit drugs in the past month compared to only 4.29% in Utah. Marijuana use follows a similar pattern. 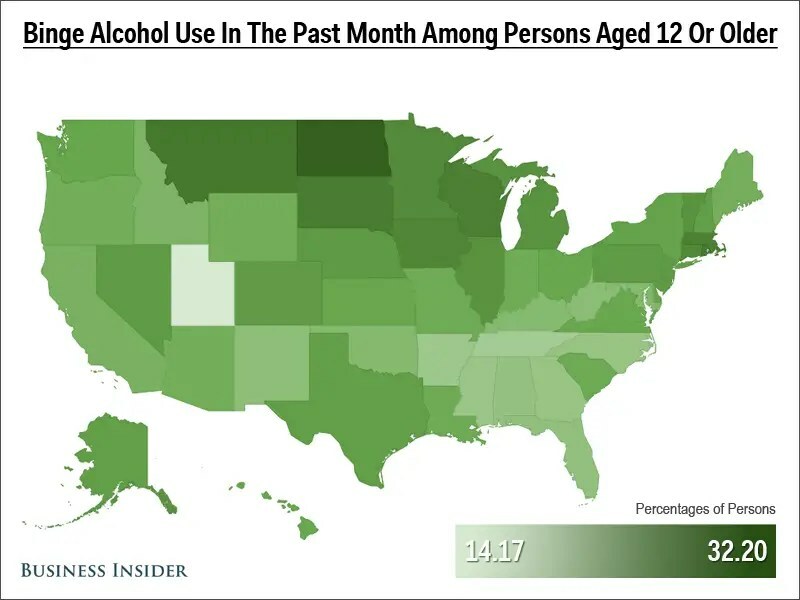 Vermont takes the lead again with 13.12% using in the past month. 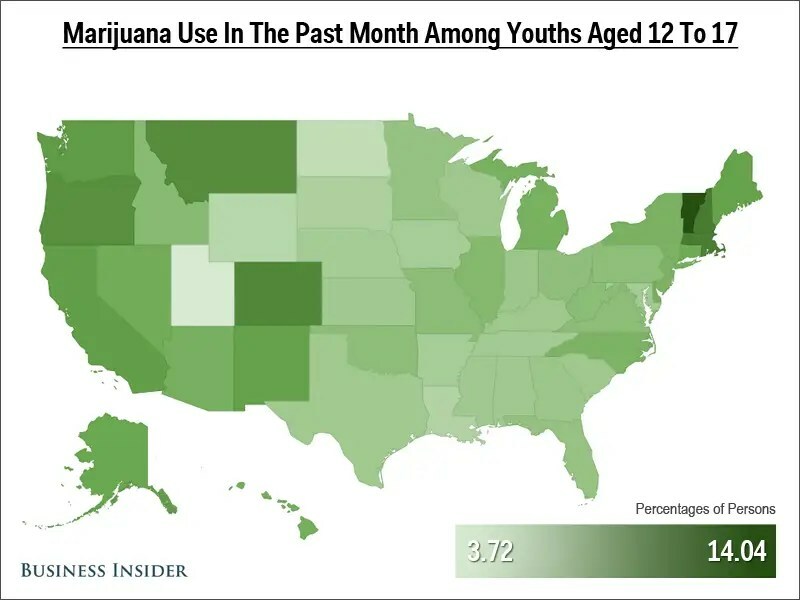 Marijuana is even more popular among Vermont teenagers, 14.04% of whom have smoked in the past month. 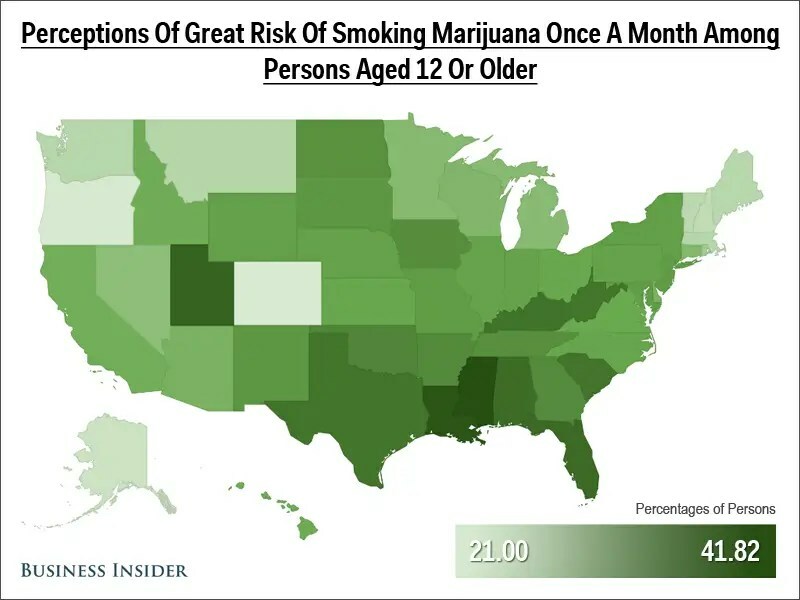 Many of the states that smoke the most marijuana have the lowest perception of risk. Nearly half (41.82%) of people in Mississippi think smoking weed is a huge risk. Washington D.C. takes the lead for coke use, with 3.04 percent of residents using in the past year. Other users tend to come from the West, Northeast, and Colorado. Illegal pain pill use is even more widespread than cocaine. 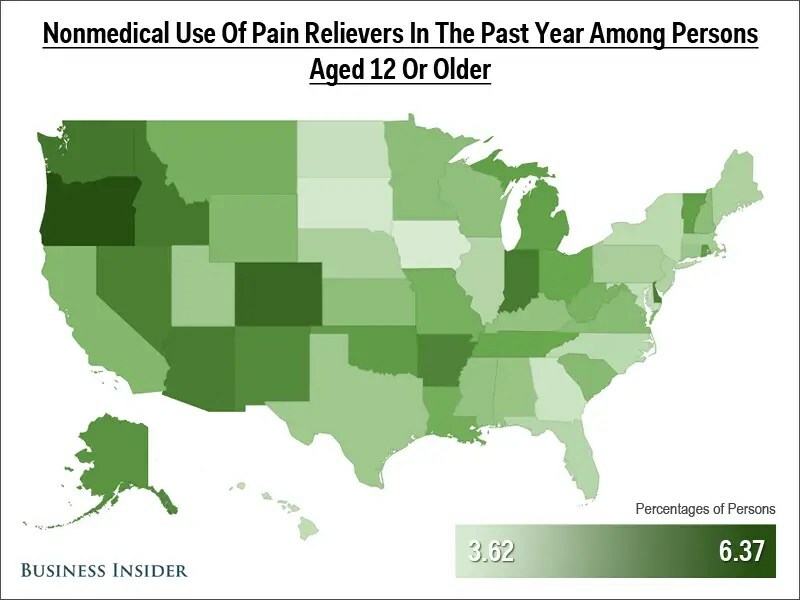 Oregon takes the lead here, with 6.37% of residents making nonmedical use of pain relievers in the past year. Iowa had the lowest rate at 3.62%. Utah is a stark outlier when it comes to alcohol use, holding up the Mormon stereotype. The state also has some of the strictest alcohol laws in the country. The state with the highest rate of drinkers is Massachusetts, where 63% of residents over the age of 12 consumed alcohol in the past month. North Dakota and South Dakota rank low compared to other states for drug use, but binge drinking is especially common there. 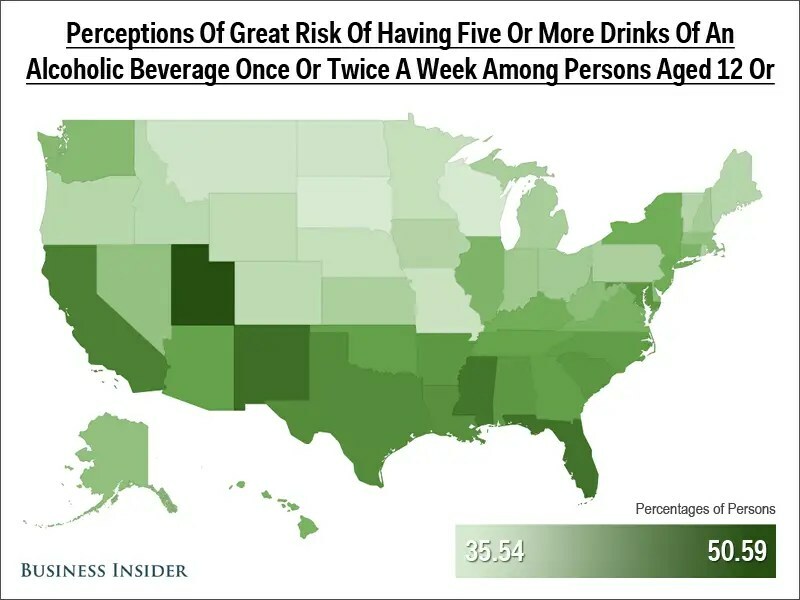 The part of the country that binge drinks the most also has the lowest perception of risk associated with drinking. 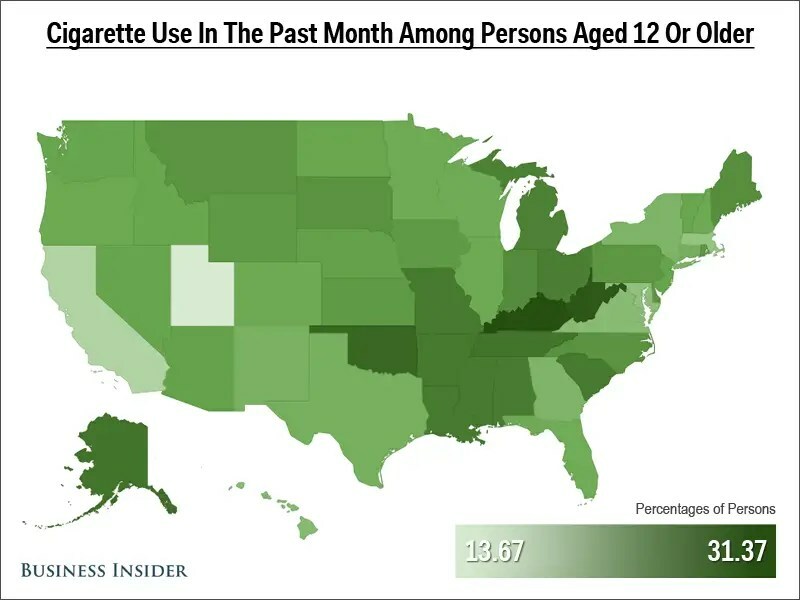 Tobacco use is most common in southern states. West Virginia has the highest tobacco use, with 38.46% of residents using in the past month. The same goes for cigarettes. 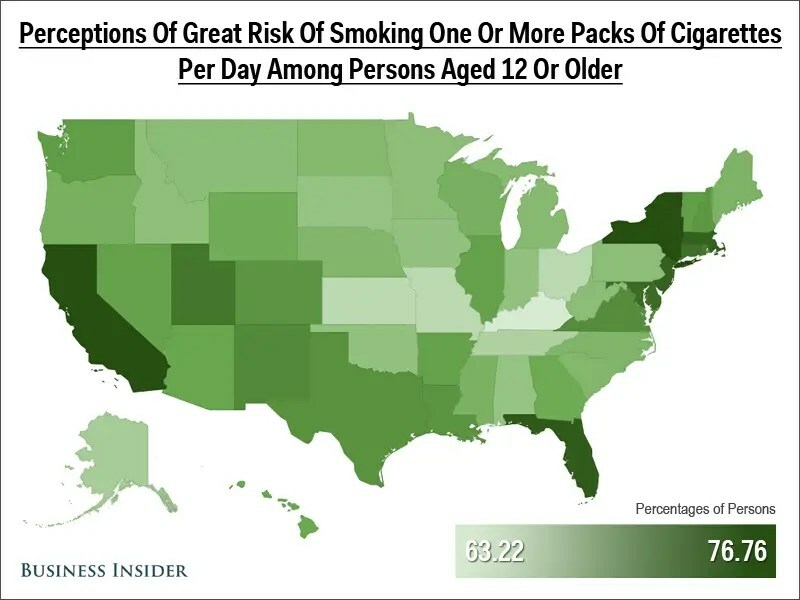 Awareness of the risks associated with smoking is pretty high overall, especially in California, New York, and Florida. 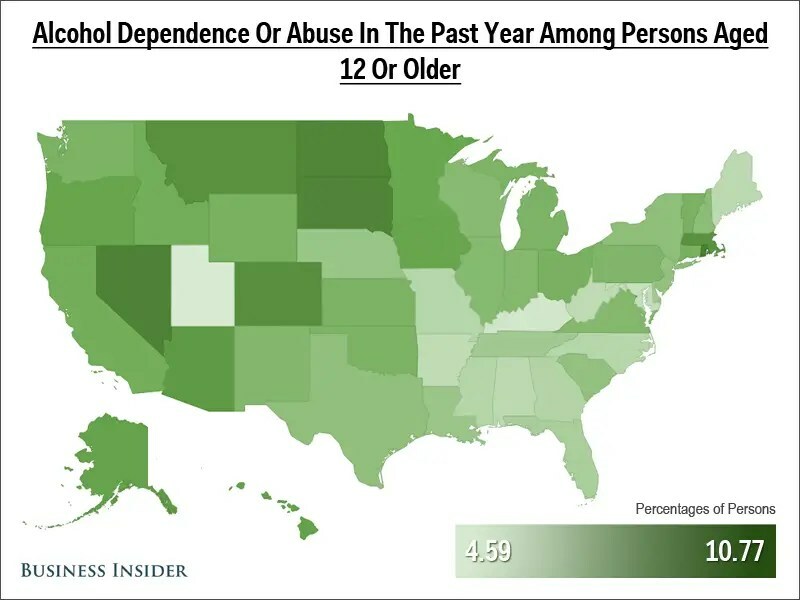 Alcohol abuse and addiction is most common in the western half of the country, with the exception of Utah. Illicit drug abuse and addiction is also most common in the West, with Vermont also ranking high. 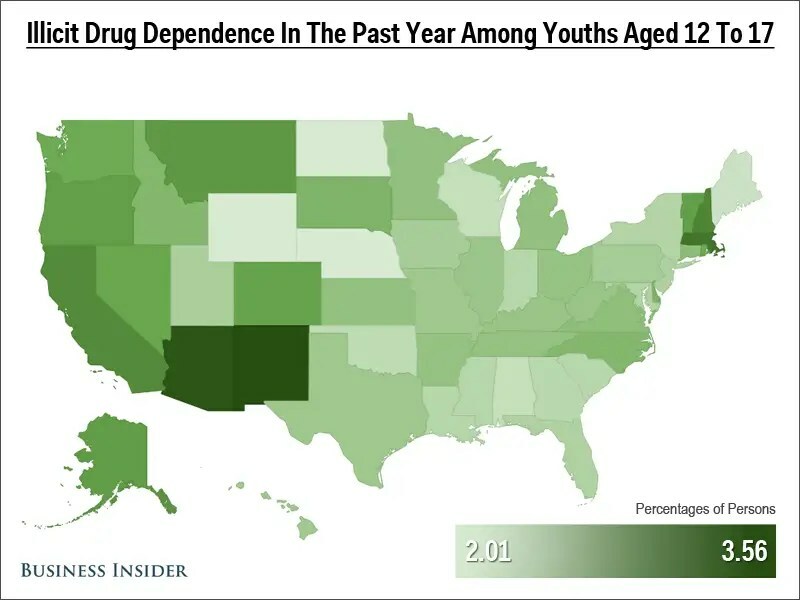 Illicit drug addiction among teenagers is fairly low overall. Every state falls between 2% and 3.6%, with New Mexico, Arizona, and New England ranking higher than other states. The former “Baddest Man on the Planet” added to his list of bizarre public appearances with another unrestrained interview, this one courtesy of Matt Lauer of the “Today Show” who sought to find out more about Tyson’s recent admission that he’s still grappling with substance abuse issues and is “on the verge of dying.” Tyson uttered those words last Friday at a post-fight press conference for his initial venture as a boxing promoter, admitting he’s just been sober for six days. Tyson visited that theme again on Thursday’s “Today Show” in a segment that was taped in Las Vegas with the two facing each other just a few inches apart and Tyson sometimes leaning over, as if trying to peer at Lauer’s notes. Lauer’s interview with Tyson was heavily hyped on “Today,” with teases sandwiched between segments on the growing crisis in Syria and news of Valerie Harper’s ongoing battle with terminal cancer. The media in attendance later rose to give him a standing ovation when Tyson told them he would never use again. Tyson said he’s been able to put that episode behind him. “I’m at peace with myself pretty much,” Tyson said. While Tyson is always raw and uninhibited, Lauer’s interview on Thursday lacked the visceral punch that his grilling of Alex Rodriguez attorney Joseph Tacopina had earlier this month on the show. In that one-on-one, Lauer surprised Tacopina with a letter from Major League Baseball in which the league said it was willing to waive the confidentiality clause in the Joint Drug Agreement to allow Rodriguez to discuss his drug testing history. No such moment took place on Thursday. Outside of giving the public a glimpse of Tyson’s struggles, the segment on “Today” also served as a promotional vehicle for Tyson’s many undertakings, such as his upcoming docu-series on Fox Sports 1 “Being: Mike Tyson” and his forthcoming HBO special, “Undisputed Truth,” which is a demo of his one-man play. While Lauer mentioned both projects, he chose not to bring up his own appearance on “Late Night with Jimmy Fallon” last year in which he poked fun of Tyson by sporting a fake facial tattoo in a humorous bit. (Updated: Sept 28th 2012 at 8:00PM) These images are EXTREMELY graphic. I’m only posting these so people can see the DANGER in this new drug called Krokodil. It comes from Russia and is new to the states and becoming more and more popular. I pray for these people who are currently going through the drugs effects. I hope the DEA can get this off of the streets and out of our country! The first cases of a terrifying new drug called ‘Krokodil’ that eats flesh from the inside out, is flammable and leaves addicts with reptilian-like skin have been reported this week in Arizona – and the state fears the beginning of an epidemic. 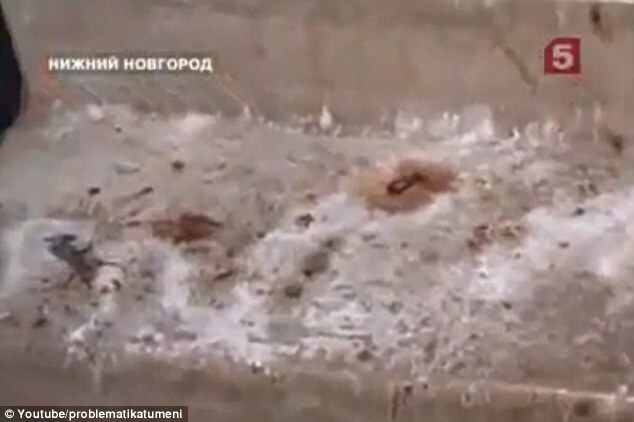 Popular in Russia, Krokodil is homemade, is three-times cheaper than heroin and created by mixing codeine with gasoline or oil, filtering it and then injecting the rancid concoction into the users body. ‘We’ve had two cases this past week that have occurred in Arizona,’ said Dr. Frank LoVecchio, the co-medical director at Banner’s Poison Control Center. Continual use of Krokodil causes blood vessels to burst, leaving skin green and scaly among addicts eventually causing gangrene and their flesh to begin to rot. Rabid use in Russia has caused up to 2.5 million people to register and seek treatment as addicts and the average life span for a user is only two to three years. ‘When drug users do it repeatedly, the skin sloughs. It causes hardening of their skin. It will cause necrosis,’ explained LoVecchio. LoVechhio says that the two cases he has encountered are most likely linked and he declined to comment on the appearance of the two users. ‘Where there is smoke there is fire, and we’re afraid there are going to be more and more cases,’ said LoVechhio. In Russia, Krokodil usage is spreading like a virus among young people and according to a Time magazine investigation, even those who manage to quit their addiction come away disfigured for life. 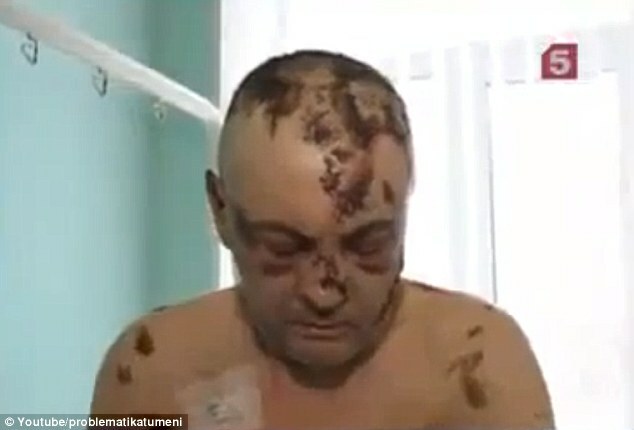 Some users in Russia develop brain damage and speech impediments in addition to the horrific scars. A Chicago-area man who helped found a heroin-abuse support group faces felony charges after allegedly selling heroin to undercover police. Rundo allegedly met undercover officers three times in Naperville, with the third and final sale occurring about 8 p.m. Sept. 16. Arizzi said Rundo drove to the area in a silver, 2000 BMW and offered no resistance when taken into custody. The heroin, allegedly delivered each time in small, foil packets, totaled six grams, Arizzi said. Rundo in July 2012 was convicted in DuPage County of driving under the influence of narcotics, following an arrest in Naperville. He and two friends in recent years helped found the Open Hearts/Open Minds heroin-abuse support group. Rundo also was interviewed for and appeared in a segment of the national TV program “48 Hours” on heroin abuse. NICOLE Kapulsky didn’t do the 12 steps. She doesn’t go to Narcotics Anonymous meetings and tell other recovering addicts about how she trekked into North Philly’s Badlands – 5-foot-nothing, alone, petrified – to buy dope. Or about the worst day of her life, when her ex-husband showed up at her parents’ house with police and took her children away. Or when her family turned their backs on her and she was calling rehab centers every hour to check for an open bed – only to relapse after she’d finally detoxed. She didn’t suddenly find God and realize that surrendering to a higher power was the only way to get clean. “I did it my way,” said Kapulsky, 35, who was introduced to heroin in 2009, after an ugly divorce, but who has been drug-free for nearly 19 months. And, importantly, her doctor’s way. In January 2011, after being away from her three sons for Christmas and New Year’s, Kapulsky decided that she needed to kick heroin for good. She’d seen it kill her friends. It had to stop. The appointment was with Dr. Richard DiMonte, an addiction-treatment specialist in Media. He uses a non-narcotic that has helped Kapulsky and hundreds of his patients reclaim their lives from prescription painkillers and heroin. It’s called Vivitrol, a monthly injection of naltrexone that binds to human opioid receptors and blocks the drugs’ euphoric effects, so addicts can’t get high even if they want to. Kapulsky said it also stopped her drug cravings. She doesn’t even think about heroin anymore, unlike in 2010, when she relapsed after methadone treatment. Doctors and researchers hate the term “miracle drug.” But Kapulsky says that’s the best way to describe her experience. Vivitrol was approved in October 2010 by the Food and Drug Administration for the treatment of opioid dependence. Experts say it could be a game-changer in combating the increasing abuse of oxycodone and other prescription painkillers, which doctors and law-enforcement officials say is helping to create a new category of heroin addicts. In 2010, about 12 million Americans reported that they’d used prescription painkillers for nonmedical purposes in the past year, according to the Centers for Disease Control and Prevention. Between 1998 and 2008, the reported abuse of prescription painkillers more than quadrupled, from 2.2 percent to 9.8 percent, among people 12 and older who entered substance-abuse treatment. “It’s really taken off over the last five years. I couldn’t even begin to tell you how bad,” said a veteran officer in the Philadelphia police Narcotics Field Unit, who asked that his name not be printed because he works undercover. “It’s much easier to get started on the pills because the doctors are writing prescriptions. Nobody thinks anything of it. This summer, opiate abuse was back in the news after the death of Eagles coach Andy Reid’s 29-year-old son, Garrett. He started with OxyContin as a freshman at Brigham Young University in 2002 and later began using heroin. His cause of death has not been disclosed, but Reid has said his son “lost the battle” he’d been fighting. Vivitrol has shown promising results so far, experts say. Instead of replacing one narcotic with another – such as methadone or Suboxone, both of which have the potential for abuse and are sold on the street alongside heroin – a monthly injection of Vivitrol forces addicts to remain clean. That enables them to participate in a support program, or, in Kapulsky’s case, one-on-one therapy, and to tackle the root causes of their addiction, which often involve mental illness. Alkermes, the company that manufactures Vivitrol, doesn’t disclose patient data, but it says net sales of Vivitrol have increased for 12 consecutive quarters. Some doctors are using Suboxone and other medicines to taper their patients off heroin or painkillers, then switching them to Vivitrol. It could be a winning formula, recent research shows. “These are just weapons in the arsenal, tools to help the patient. But if the underlying cause is still there, the likelihood of success diminishes considerably,” said Dr. Hani Zaki, director of psychology at Eagleville Hospital in Montgomery County, which treats substance abusers. Zaki said the nature of addiction is still widely misunderstood. Recovery isn’t a matter of days or weeks or months, he said, “it’s always years.” Very few addicts can do a quick detoxification then go on with their life without the risk of relapse. For Kapulsky, who now lives in Boothwyn, Delaware County, Vivitrol serves as a safety net while she pieces her life back together after she was blindsided by heroin addiction in 2009. She has regained joint custody of her children, reconnected with her sister and helps care for her 1-year-old niece. She goes to therapy once, sometimes twice, a week, and plans to take college courses to become a drug-and-alcohol counselor. She’s happy now, and quick with a smile. But Kapulsky said she knows four people who died from heroin this summer alone, including a close friend. She’s trying to spread the word that Vivitrol is available – and covered by many insurance plans – for people who want to get clean and stay clean. PROVIDENCE, R.I. — Rhode Island has received an $11 million, five-year grant from the federal government to target the abuse of alcohol, marijuana and prescription drugs by teens and young adults. The state’s Department of Behavioral Healthcare, Developmental Disabilities and Hospitals announced the award on Wednesday. The money will go toward local community efforts to prevent youth substance abuse.Statistics from 2011 indicate that 30 percent of high school students in Rhode Island report having consumed alcohol in the past 30 days. More than 6 percent report drinking and driving within the past month.Gov. Lincoln Chafee says the money will help enhance efforts to prevent dangerous abuse by some of the state’s most vulnerable citizens. Parents who are addicted to drugs or alcohol are more than twice as likely to have children who develop depression in adulthood, according to a report published online in the journal Psychiatry Research. Parental addictions were associated with more than twice the odds of adult depression, said lead author Esme Fuller-Thomson, Ph.D., of the University of Toronto. “Even after adjusting for factors ranging from childhood maltreatment and parental unemployment to adult health behaviors including smoking and alcohol consumption, we found that parental addictions were associated with 69 per cent higher odds of depression in adulthood,” she said. “These findings underscore the intergenerational consequences of drug and alcohol addiction and reinforce the need to develop interventions that support healthy childhood development,” said Fuller-Thomson. “As an important first step, children who experience toxic stress at home can be greatly helped by the stable involvement of caring adults, including grandparents, teachers, coaches, neighbors and social workers. The study was unable to determine the exact cause of the relationship between parental addictions and adult depression. According to co-author and graduate student Robyn Katz, ”It is possible that the prolonged and inescapable strain of parental addictions may permanently alter the way these children’s bodies reacts to stress throughout their life.